As the Earl of Ashby, Lord Edward Granville has never been in short supply of luck, earning him the nickname 'Lucky Ned.' Why should he not take risks most sensible men would run from, since the tide always turns in his favor? Making a wager that he can have any woman he desires even without his title, Ned switches places with John Turner, his friend and secretary. But once he does, Ned's luck suddenly abandons him, for the ladies now have eyes only for Turner. When Ned meets governess Phoebe Baker, he becomes intent on gaining her affections. Phoebe wants nothing more than to keep her head down, teach her students, and go unnoticed-especially by the Earl of Ashby. But his rakish secretary has the infuriating habit of constantly crossing her path. Yet Phoebe cannot deny that her pulse quickens in Ned's presence. 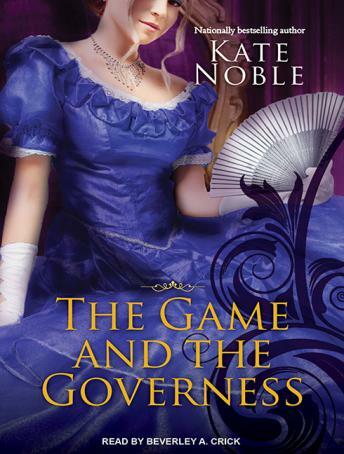 If this prim-and-proper governess lets her heart rule, will fate intervene where Ned's luck has forsaken him?